New York-based artist / photographer Stephanie Pfriender Stylander’s series The Roar of Silence hums with ambiguity whilst examining the abstract moments which occur between subject and observer. The artist discusses the tensions between Eastern and Western culture and fragments of personal histories. A: Roar of Silence examines abstract moments between subject and observer. Could you describe the process of this series? How did the idea develop and come into being? SPS: Upon my first trip to Rajasthan, India I was captivated by the local women who were completely covered in draped fabric from over their faces to their toes. The scene was like a nocturnal dream, beautiful and disturbing which kept haunting me day in and day out. These women had and or chose to wear these coverings over their faces and bodies for religious and or cultural reasons. One could assume they were hiding, one could also assume that this was their custom and there was nothing unusual for them, it was safe and right. 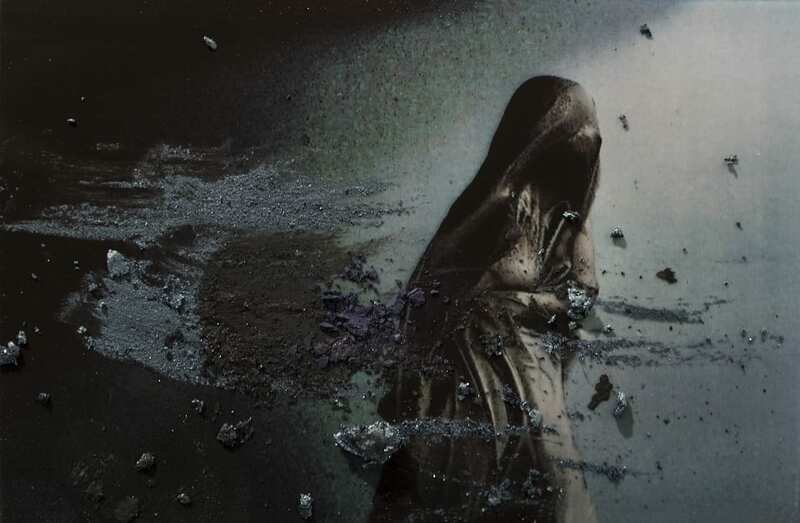 As a Westerner knowing some of the horrible issues for women in India and the world I started thinking of this shrouded figure as a symbolic representation of the hidden self, resonating today in particular with the political and sociological flux that is moving through our world. I became interested in the inherent contradictions and a distilled symbolic language started forming which were the first seeds of my project, The Roar of Silence. A: What materials do you use in constructing the compositions? SPS: When I think about unconscious processes I think abstract, blips of left over fragments from our personal histories that leave their marks on us as time goes by and become our personal code. I work in the studio to create these images I am alone, I am the subject, I am the photographer, I am the viewer. I photograph then apply the mixed materials onto the image, the act is a sort of fury and then it is over, like a performance art piece. I work with Polaroid, makeup, gold flakes and at times some other materials. These are the tools that allow me to speak in symbolic metaphors. A: The multi-media works appear to be manipulated photographs – could you talk about the layers involved in their creation and the relevance of each layer to you? SPS: There are layers in the work, the Polaroid, then the application of the materials upon the Polaroid, then the photograph. Layers reveal representations of the human experience, suggesting abstract thought, private and ambiguous, like a poem that then would be interpreted uniquely by each viewer. The first layer is the portrait, I keep the form minimal with slight movement, a representation of a figure. The added layers begin with different applied applications of makeups, flakes, dust and represent the hidden which emerge onto the surface leaving clues. Another layer is to re-photograph the polaroid with the materials, creating a new merged piece between the conscious mind and the unconscious the figure with its complex memories. A: Is there a particular narrative that you’re depicting in the works, or are they more snapshots of the uncanny? SPS: There is no narrative, there is nothing linear about my process. It is a instinctual exploration, it is perception, it is live theatre. I am both the subject and the photographer it is an abstract act and thought, it doesn’t matter who the subject is, what I am interested in isn’t the subject as we know it, but the abstract state of a subject, the “hidden layer,” this layer can create a collision of force, this force is the uncanny, the magic, I am after that. Also in providing no face and not revealing a body in the portrait, instead I use a tabula rasa, which then aids in freeing up the mind to free associate, leaving more room for imagination and fantasy. A: What is your background? SPS:I have an Associate of Science degree in Photography from Endicott College in Massachusetts and a Bachelor of Fine Arts from the School of Visual Arts in New York, and at the same time I minored in Psychology and then continued my education years later at the Center for Modern Psychoanalysis in New York. I started my career in Europe in fashion photography during the early 1990’s, working for great magazines and teams like French Glamour, British GQ, Uomo Harper’s Bazaar, Mirabella, when fashion photography was an art form and I was lucky to be a part of that exciting, creative world. Years later I became known for my celebrity portraits and was also fortunate to meet talented icons of our 21st Century, like Keith Richards, Nicole Kidman, Heath Ledger, Björk. That being said, I always had this yearning to work purely as an artist with no restrictions except for my own restrictions which I place upon my work. Roar of Silence is a mirror that I understand. I am after a full experience, I need to work with every aspect of myself in my art, the good, the bad, the unknown, the mistakes the conquests, all of it. 1. Stephanie Pfriender Stylander, Aftermath. Courtesy of the artist. 2. Stephanie Pfriender Stylander, Interference. Courtesy of the artist. 3. Stephanie Pfriender Stylander, Stromboli. Courtesy of the artist.